“It's a tremendously painful day for us, for me personally the most painful in six years,” said Wolff, after the team suffered their first double DNF since Spain 2016. Valtteri Bottas, at the time running in second place, was out early as his car had enough after just 13 laps. “The luck I'm having this year feels like a bit of a bad joke at the moment,” the Finn commented. “My start was not ideal; I had quite a bit of wheel spin and there was less grip than we expected, so I dropped a few places. Going into Turn 3, I could recover two places and was back in second place. The resulting virtual safety car period saw almost the entire field make an early pitstop. Mercedes however opted not to pit Hamilton. The missed stop created lots of frustration with Hamilton, who repeatedly asked his team what had happened. This ended in the team's chief strategist, James Vowles, apologizing for the mistake. He also urged Hamilton to focus on the remaining race, rather than worry about what could not be changed. But pushing hard on the soft tyres caused blisters and an inability for Hamilton to close the gap to the cars ahead. Eventually, he retired with a lack of fuel pressure. 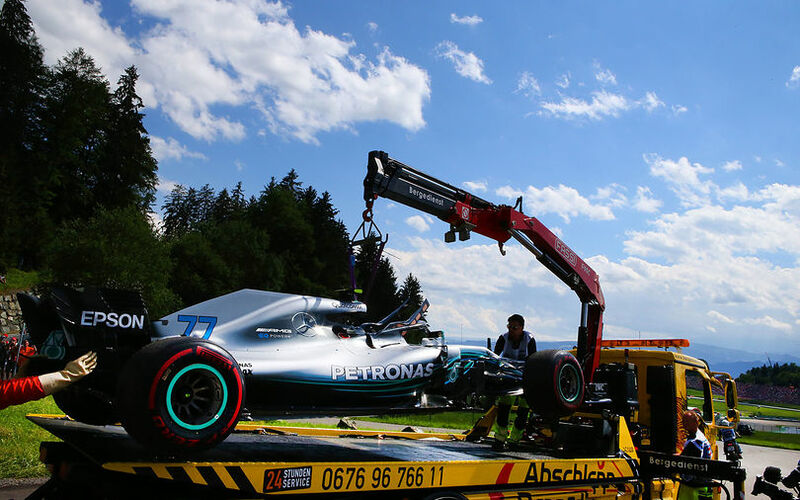 Mercedes's Trackside Engineering Director, Andrew Shovlin, summed up a disastrous weekend for Mercedes. “We weren't reliable enough, we didn't make the right strategy call, our starts weren't good enough and we didn't manage the tyres as well as we could have done. We have a lot to improve by Silverstone and we need to put all our focus into remedying our weaknesses today. With the double DNF, Mercedes has lost the leading positions in both championships, having them over to Ferrari and Vettel.